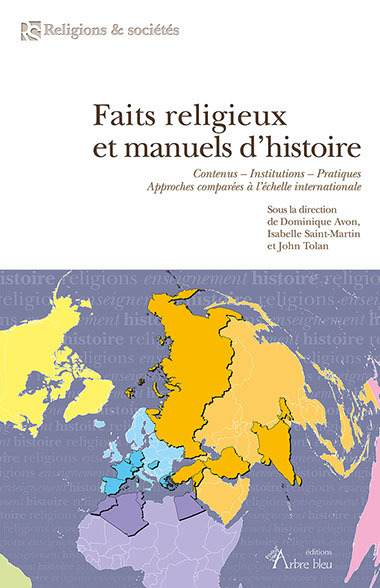 The proceedings of the first international conference of the IPRA (in December 2015 in Le Mans University, with the partnership of the Institut européen en sciences des religions, EPHE, and with the help of the CERHIO), entitled Le fait religieux dans les manuels d’histoire. Contenus. Pratiques. Institutions. Essai de comparatisme à l’échelle internationale (Religion in History School Books. Contents. Ways of Teaching. Institutions. Attempt at an International Comparison) were released this September by the Editions L’Arbre Bleu. Let’s remind the main aspects of this conference : Controversies are abundant concerning the contents of the history school programmes: accusation of undermining this religions while overestimating the other; hidden or open promotion of messages of rejection or hatred; acknowledgment or rejection of the work of orientalists and post-colonial studies; resorting to discourses that are devoid of historical method. Debates occur within societies but are also connected with external interventions of supranational bodies, religious or not. Lobbies were constituted to act explicitly upon these topics and subjects. A conflict of competence on the object is at stake up and down the process of composing the textbooks. Institutes and department, whether they are Catholic, Protestant, Orthodox, Sunnite (from universities in the Maghreb or from North America, such as the International Institute of Islamic Thought), Shiite, Hindu or the “Jewish People” (official terminology at the Hebrew University of Jerusalem, for instance) produce a discourse impacting the teaching of history and the way in which it is received by students. 30-odd scholars and experts from all around the world were gathered to study the teaching of religion in history classes. Their communications aimed at proposing a state-of-the-art of these aspects of teaching history in relation to religion and to analyse the complex processes that are stake in the construction and reception of the discourses they involve. Dominique Avon: Director of studies at the EPHE, PSL, GSRL. 15 centuries of religious cohabitation: what about tomorrow?